The private historic schist Miner's Cottage is designed for superior two person accommodation and is within 200m of the historic, Tiroiti, Capburn Rail Bridge which forms part of the Otago Rail Trail. 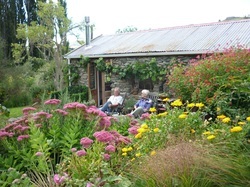 The Miner's Cottage is set amongst 100 year old Lombardy poplars and enjoys a private court yard, garden and stream. The accommodation gives a real taste of Central Otago. Tiroiti, 6 kms north of Hyde, is the ideal stop for your first or last night on the Rail Trail. The Miner's Cottage has the charm of yesteryear with a twin bedroom, bathroom, and a self contained lounge with access to the courtyard garden. The facilities and decor have been upgraded and are in keeping with the integrity of the structure. The private yard gives a peaceful enviroment to relax in after your experience on the Rail Trail and the opportunity to enjoy Central Otago at its best. We provide an evening meal with a main course and dessert, with the majority of produce from our extensive vegetable garden and orchard. If you are seeking unique, quiet, Rail Trail accommodation in the Hyde, Tiroiti locality with a private rural setting then we are sure the Miner's Cottage accommodation will suit you and ensure you are revitalized for the next stage of your journey along the Rail Trail. We offer the only accommodation at Tiroiti.